“…the art of memory with which he has evoked the most ungraspable human destinies and uncovered the life world of the Occupation,” although the Occupation is not so prominent in Missing Persons as it is in a couple of the works in Suspended Sentences. Most of the first-person protagonist’s memories go back to the late 1930s when many Jews were leaving France – or trying to. 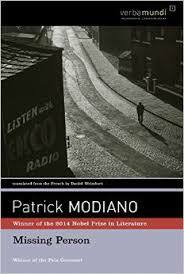 And although it follows along the lines of Modiano’s own biography – the overarching theme is memory and identity. It’s as though he lifted the themes and story from his own unusual life. – And some of the incidents are touched on in his other books, too, a garage in Paris, the boarding school, the photographer and photographs. “You were right to tell me that in life it is not the future which counts, but the past.” (Chapter 27). The tension builds as our protagonist remembers who he was/is and what happened to him and Denise and the others. Between the theme of memory, melancholy and sense of change, it obviously reminded me of Proust’s volumes but also of Orham Pamuk’s Istanbul, Memories of the City which I read many years ago – probably 2005 – a really delightful if melancholic memoir. Of course Missing Person is fiction, but so is Swann’s Way. And Modiano cannot possibly be the protagonist because he wasn’t born until 1945, after the Occupation was over, but immediately afterwards. But Modiano grew up in Paris right after WWII, a period of great melancholy as the people assessed the damage done to and by themselves. Modiano knew the sense of loss, of melancholy, of damage and he probably heard first hand about the people who went missing. Modiano’s father was from a Sephardic Jewish family and after refusing to wear the yellow star and he worked with the French Nazis in selling blackmarket items. His mother was a struggling movie actress who was often away. Patrick was left to the boarding schools and family. The themes are what is important in these books – there might be a murder in the “plot” – maybe a really old murder, but the books are really about our memories and the way they live on – how and what we remember – or what we don’t – and what others remember – or don’t – and of course, why this is remembered and not that. Also of concern is how things change, like street and cafe names, and how some things don’t . Another theme is the loose connections we have with people – what if someone walked into my life asking about someone I knew briefly many years ago and wanted to know where they lived, who they knew – how could I help? My girlfriend’s daughter for instance. The occupation in France uprooted many people, especially in Modiano’s own life – I suppose that plays a part here but not an important one. If you enjoyed one of Modiano’s books I strongly suggest you go on and read others because they all seem to be in the same general vein – solving the puzzles of memory.